Hypoxia Inducible Factor and Anemia. Several new therapies to treat anemia in patients with CKD and ESRD have recently been launched that will likely expand the treatment options. For the last few weeks I have been hearing frequently about Hypoxia Inducible Factors (HIFs) and anemia. First of all, what are HIFs? They are transcriptional activators that function as master regulators of oxygen homeostasis and play an important role in the body’s response to hypoxia. HIF-1 was discovered in 1992 and purified in 1995. In the original research, the authors reported that HIF-1 activates EPO gene transcription in Hep3B cells that are exposed to hypoxic environments. HIF-1 is a heterodimer, consisting of alfa (HIF-1α, HIF-2α and HIF-3α) and a beta subunit which has three isoforms (Arnt1, Arnt2, Arnt3). 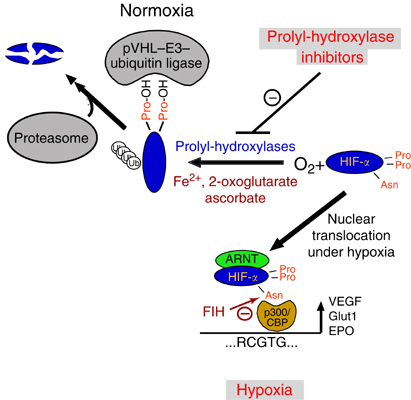 Under well-oxygenated conditions, HIF-1α is expressed and bound to Von Hippel-Lindau (VHL) protein and is rapidly degraded via hydroxylation at proline residues (PHD2). PHD2 uses oxygen as substrate and its activity is inhibited under hypoxic conditions which causes accumulation of HIF-1α. This process increases vascularization (angiogenesis) in hypoxic states such as ischemia, tumors, immunological responses, homeostasis and anaerobic metabolism. It also has an important role in tumor proliferation as it has been found that the HIF-α levels are increased in certain types of tumors. In chronic kidney disease, the lack of EPO expression causes anemia which typically is treated with recombinant human EPO (rhEPO). This topic has been covered extensibly at the RFN here, here and here. This month in JASN, a phase II study was published about an investigational drug for the treatment of anemia, an oral hypoxia-inducible factor prolyl hydroxylase inhibitor (GSK1278863). In this research, 73 patients with CKD not on dialysis and 83 patients on hemodialysis were enrolled to receive the experimental drug at different doses (0.5 mg, 2 mg and 5 mg) compared to a control group (placebo for patients not on dialysis and patients on hemodialysis receiving recombinant human erythropoietin -rhEPO-) The results were quite surprising: In the nondialysis group, the experimental drug increased the hemoglobin levels at week 4 (average of 1 g/dl). In the hemodialysis patients that were switched from rhEPO to the experimental drug (5 mg), an increase in maintaining a mean hemoglobin concentration was achieved only in the high-dose group, but not in the lower-dose group. These results suggest that this drug may be a good alternative to rhEPO. Theoretically, high EPO concentrations achieved during rhEPO treatment, contribute to the cardiovascular effects in patients with CKD. Although this study was short, it brings to light the importance of finding good alternatives to treat anemia in patients with CKD and on hemodialysis. Given the reported adverse events with rhEPO treatment and the promising results of this trial, a phase III trial, a larger population study and longer duration is required to test the safety and efficacy of this drug. Keep your fingers crossed. Everyone is invited to the 2015 blogger night (I believe it is the 5th annual) at BarleyMash on the corner of 5th and Market on Thursday November 5th from 7-11pm. The event is hosted by NephJC and Satellite Healthcare. That means free appetizers and refreshments. Would be great to see many RFN fans show up and support online nephrology. See you all in San Diego. The past two weeks have been exciting for the field of regenerative medicine in nephrology. Two papers demonstrated the feasibility of developing kidney cells from human pluripotent stem cells. One from the USA by Dr Joseph Bonventre’s group at the Renal Division of the Brigham and Women’s Hospital (Morizane, Lam et al. Nat Biotechnol 2015) and one from Australia by Dr Melissa Little’s Group at University of Melbourne (Takasato et al. Nature 2015). 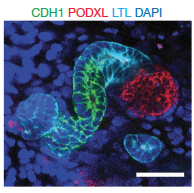 The major breakthrough of these publications is that they were able to generate with a high efficiency mature nephrons (with podocytes, proximal tubules, loops of Henle and distal tubules) starting from nephron progenitor cells! Albert Lam, one of the co-authors of the Nat Biotechnol paper, stated that: “We established a differentiation protocol that would mimic the stages of nephron formation as closely as possible. Our approach in recapitulating the steps of kidney development resulted in a highly efficient protocol for generating kidney organoids. The ability to do this using induced pluripotent stem (iPS) cells, which are derived from skin or blood cells of patients, allows the creation of kidney tissue without ethical concerns and allows the tissue to be “personalized”, that is, generated from a particular patient. If in the future the tissue is re-implanted back into the patient, the immune response may then be very limited since the tissue will be recognized as self.” This achievement has an enormous potential impact on a variety of clinical and translational applications, including kidney tissue bioengineering to replace lost kidney tissue, renal assist devices to treat acute and chronic kidney injury, drug toxicity screening, screening for novel therapeutic agents, and human kidney disease modeling.